A smart speaker with a home voice assistant is a useful and fun device to have, whether you plan on integrating it with a home automation system or not. You can ask questions, set timers, check the weather or your calendar, and do a lot more, depending on the other devices in your home. But which one to get? There are a number of smart speakers on the market, and the differences between them can be overwhelming. Never fear, we’ve got you covered with a list of the best smart speakers and reasons each one could be right for you. The first aspect to consider when deciding on a smart speaker is your voice assistant preference. If you’re dead set on using Alexa or Google Assistant, you know you’ll want an Amazon Echo or a Google speaker. If you’re a dedicated Siri fan, you’ll need an Apple-friendly speaker. But if you don’t have a voice assistant preference, read on to find out which speaker will be best for you. How can you use a smart speaker? 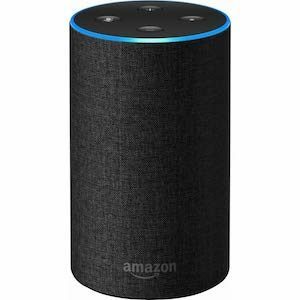 It’s no secret that Alexa is the most versatile home voice assistant when it comes to home automation, so the Amazon Echo (2nd generation) is our top recommendation for a smart speaker as a part of a larger home automation system. Amazon speakers have more third-party integrations than any other brand, and Alexa has more skills than any other voice assistant. In other words, you can do more with Amazon Alexa. The Amazon Echo integrates easily with all kinds of home automation equipment and brands, including Samsung SmartThings and Nest, two of the most popular home automation systems. You have multiple brand options to connect smart locks, lighting, thermostats, cameras, video doorbells, and more to your Amazon Echo and can then use Alexa to control and monitor all aspects of your smart home. Check out our favorite products that integrate with Alexa here. The Amazon Echo is great for multiroom audio. 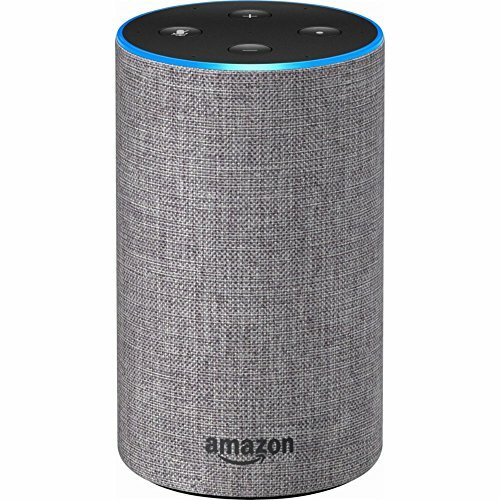 With multiple speakers placed in different rooms, you can play music on all the speakers, but if you need to talk to Alexa, only the closest speaker to you will respond. In addition to accessing Amazon Music, the Echo can also play audio from Spotify, Pandora, iHeartRadio, Audible, and more. Alexa is also compatible with any Amazon Fire TV products, giving you even more entertainment options. If you’re on a budget, the Amazon Echo Dot works about as well as the Echo but at about half the cost. You lose the sound quality of the Echo with the Dot, which is one reason we prefer the Echo. However, the Echo Dot can connect to other speakers through an audio output port, so there is an easy work-around. If you’re truly dedicated to your smart home setup, the Amazon Echo Plus includes Zigbee technology for more home automation integrations. It can automatically detect other smart devices, simplifying your smart home setup. However, for not very many different features, it costs around $150 versus the Echo’s $100 or less, so ultimately we recommend the Echo. Dimensions: 5.75 x 3.5 x 3.5 in. If you care more about the voice assistant aspect of your smart speaker, the Google Home is the best choice for you. 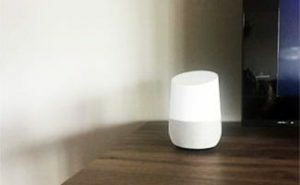 The Google Home is equipped with Google Assistant, so it responds to free-form questions with variable wording. It also can follow the flow of conversation without requiring you to reframe each one. For example, with Alexa you generally have to say “Alexa” at the beginning of each question or request; with Google Assistant, you can say “Hey Google” once and then keep the questions coming without repeating the wake-up words. Google Assistant and the Google Home are generally easier to use, especially if you aren’t used to a voice assistant, so we definitely recommend it for anyone new to smart speakers. 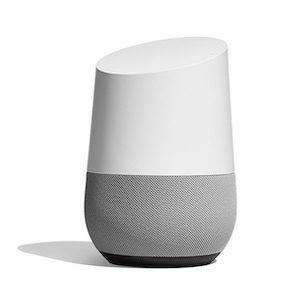 The Google Home lets you add up to six different Google accounts, and it will automatically switch between the accounts depending on who is speaking. So for example, if you ask Google Assistant what’s on your schedule, it will check your Google calendar; if your spouse asks the same question, it will check their Google calendar without being asked to switch. That’s another advantage over Alexa, where you have to specify when you switch accounts. On the flip side, you are limited to only Google accounts with the Google Home, so keep that in mind. Although Google Home doesn’t have as many third-party home automation integrations as the Amazon Echo, it does still connect with many of the top brands that we recommend, so you don’t have to sacrifice much as you build your smart home. Those brands include Samsung SmartThings and Nest (two of our top home automation systems), as well as many others. You can check out a more detailed list here. As with the Amazon Echo, the Google Home comes in multiple versions for different budgets. If you aren’t worried about sound quality, the Google Home Mini gives you all the versatility and user-friendliness of the Google Home, but at less than half the price. If you want a smart speaker with great sound quality, the Google Home Max is the one for you. It competes with our pick for the best smart speaker for sound quality, the Sonos One, but with one pricey caveat—it costs around $400. But it’s a big step up from the Google Home, which is why we recommend it. Dimensions: 5.6 x 3.8 x 3.8 in. 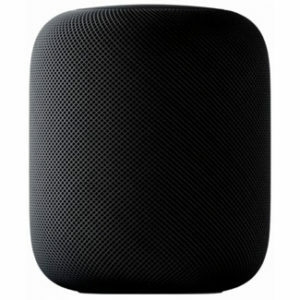 If you own or plan on owning an Apple HomeKit, or if you are solidly dedicated to your iPhone, the Apple HomePod is the right smart speaker for you. To be more accurate, it’s the only smart speaker for you—the Apple HomePod is the only smart speaker that uses Siri and integrates with other Apple products. The Apple HomePod has a lot to recommend it, including an immersive sound. It uses seven tweeters and amplifiers to create 360-degree sound and eliminate echoing off table tops or walls. The technology also adapts to the space it’s in for the optimal sound. Users have been very impressed with the sound quality, and some even consider it the best speaker for sound. The HomePod primarily connects to Apple Music, iTunes, and Apple Podcasts—and with AirPlay, you can use another iOS device to access other music platforms like Pandora, Spotify, Amazon Music, Audible, and iHeartRadio. 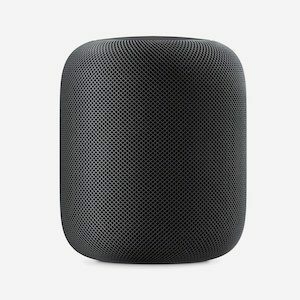 We love that the Apple HomePod integrates smoothly and easily with other Apple products. Setup is a breeze, and if you have Apple HomeKit or an Apple TV, everything will be interconnected. On top of that, the HomePod includes Apple’s new and exclusive A8 chip, which helps the HomePod run faster and more efficiently. Basically, the chip gives the speaker almost the same speed and capacity as a smartphone. As far as home automation integrations are concerned, the Apple HomePod is more limited than Alexa, but it still gives you enough options to put together quite the smart home. It has options for smart lighting, thermostats, locks, cameras, and more, though it does not integrate with some of the top brands like the Amazon Echo and Google Home do. You can read more about what works with Apple HomePod here. Another reason to make sure you are dedicated to the Apple platform is that the Apple HomePod costs significantly more than an Amazon Echo or Google Home at around $350. That’s more than any other speaker on our list (except the Google Home Max), so take that into consideration before committing. Dimensions: 6.8 x 5.6 x 5.6 in. The Sonos One is an awesome speaker with great sound quality that also happens to have a voice assistant. With Amazon’s Alexa built right into the high-quality speaker, the Sonos gives you the best of both worlds. Sonos has long been a top-quality speaker brand, and the Sonos One continues that tradition. The sound is the best of any smart speaker currently on the market. The Sonos One’s TruePlay Tuning unique feature analyzes the size and layout of your room and adjusts the sounds settings accordingly to fill the space with sound. The Sonos One has some competition from both the Google Home Max and the Apple HomePod in terms of sound quality, but at around $200, it costs much less than either of those speakers. Because the Sonos One has Alexa built in, you get most of Alexa’s third-party skills and commands, but there are some limitations. For example, voice calling, setting reminders, and a few similar abilities are not available. You also still have to use the wording and language specific to Alexa. However, there are plans to add support for Google Assistant in the future, which will make the Sonos One the only multi-assistant device on our list. 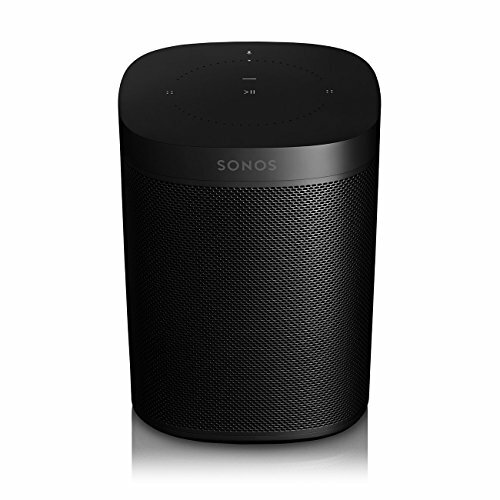 Because the Sonos One is primarily a speaker, it connects with more music streaming services than any other smart speaker we’ve seen. The full list includes more than 60 services, including Spotify, Pandora, Amazon Music, Google Music, Apple Music, iHeartRadio, Audible, and Audiobooks.com. Unlike the other smart speakers on our list, the Sonos One isn’t limited to one music service, so you can access playlists from multiple platforms. Sonos One has some home automation integrations, but they are limited compared to the other smart speakers. Wink, Lutron, and Logitech work with Sonos, so you do have some options for your smart home, but if building a smart home is your main concern, you should check out other options first. 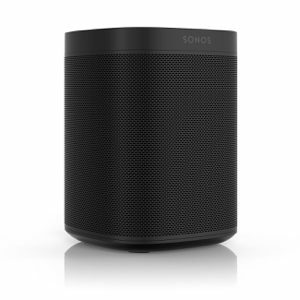 Read more about what works with Sonos One here. Dimensions: 6.3 x 4.7 x 4.7 in. No matter what you are looking for in a smart speaker for your home, there’s a good fit out there. Whether you want to focus on home automation, music streaming, keeping your Apple devices together, or getting the best possible sound quality, you can find what you’re looking for. Ultimately, the choice is yours to decide what will fit your home and life best. Do you have a smart speaker? Tell us what you love about it in the comments below.